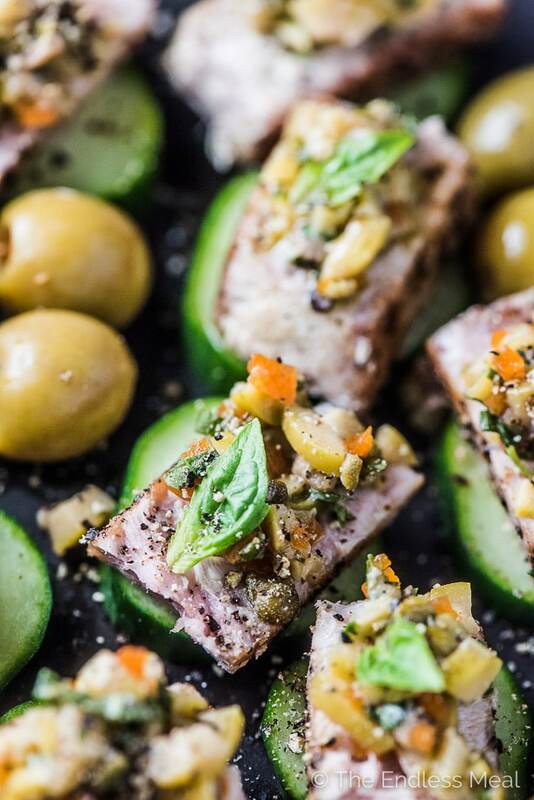 This pan seared tuna is topped with a tapenade made with Spanish Manzanilla olives and served on a crunchy cucumber slice. It's a fancy looking but easy to make (and healthy!) appetizer recipe! It's officially party season! And you know what that means … APPETIZERS! Appies, tapas, picky bits, party bites. Whatever you call them, they make eating fun. 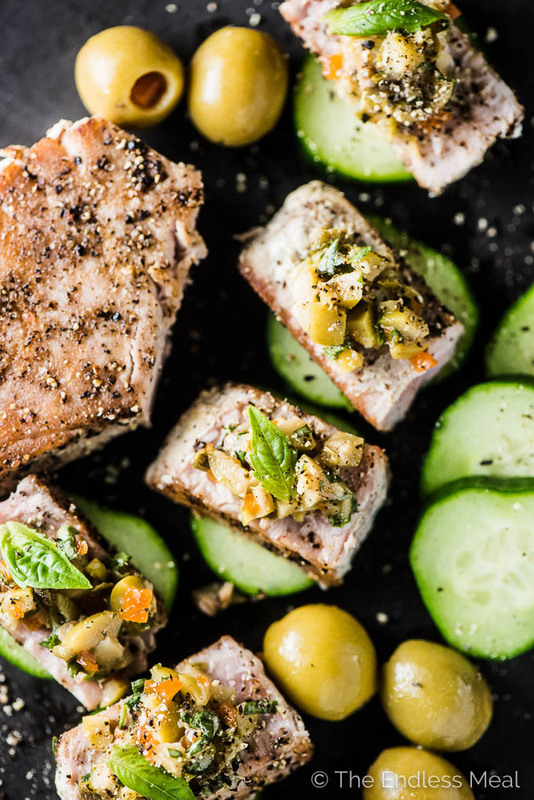 This seared tuna recipe is a take on a recipe made by Chef Dino Renaerts that I got the chance to taste at Olives from Spain's booth at the Eat Vancouver event I went to last weekend. He made his with flame torched mackerel, which was SO GOOD! I've chosen to use easier to find Pacific Albacore tuna and sear it in a hot pan. Chef Renaerts served his on baguette slices while I opted for a paleo and gluten-free friendly sliced cucumber. I kept his tapenade exactly the same, because why mess with perfection. 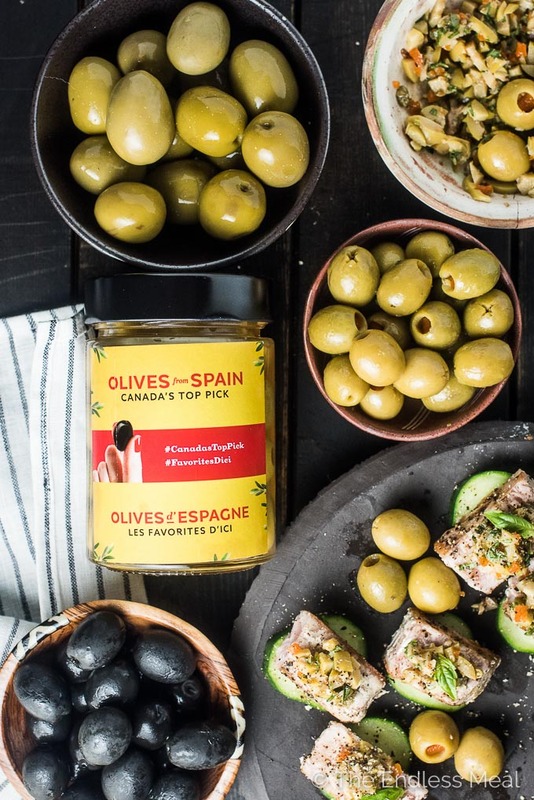 BTW: have you entered the giveaway that Olives from Spain is hosting for a culinary experience worth $750? If not, make sure you do before November 25th! I know that seared tuna sounds like a fancy recipe that is hard to make, but trust me, it's super easy. The best part is that it can be made 100% in advance so there is no fiddling around last minute trying to put together your appy while your friends are knocking at your door. Make ahead appetizers are the best for parties! Especially ones that look as pretty and are as tasty as this seared tuna. The star of this recipe is the Spanish manzanilla olive tapenade. Manzanilla Olives from Spain are buttery, smooth flavored, and are not overly salty. They're absolutely perfect in the tapenade as they don't overpower the seared tuna. 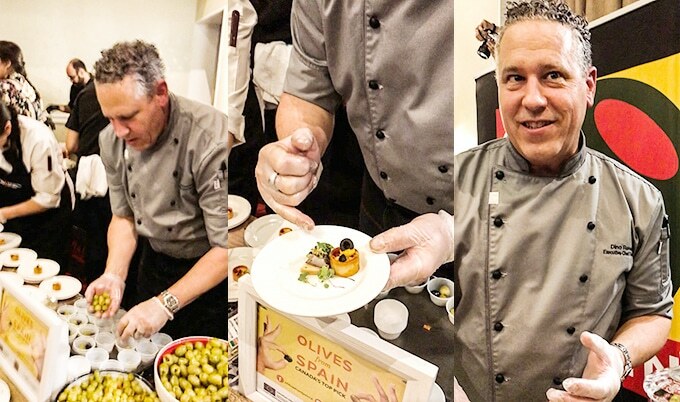 Interviewing Chef Dino Renaerts, I found out we had something in common; our love for Olives from Spain. I have a hard time picking a favorite variety as they're all so good. His favs are the Spanish manzanillas used in this recipe. The best takeaway from the night was learning how Renaerts, who told me he was ‘born on olives', likes to serve them when he's at home with his friends and family. He said he likes to toss them in fennel seeds and chili flakes then reheat them in olive oil to bring out their fragrance. 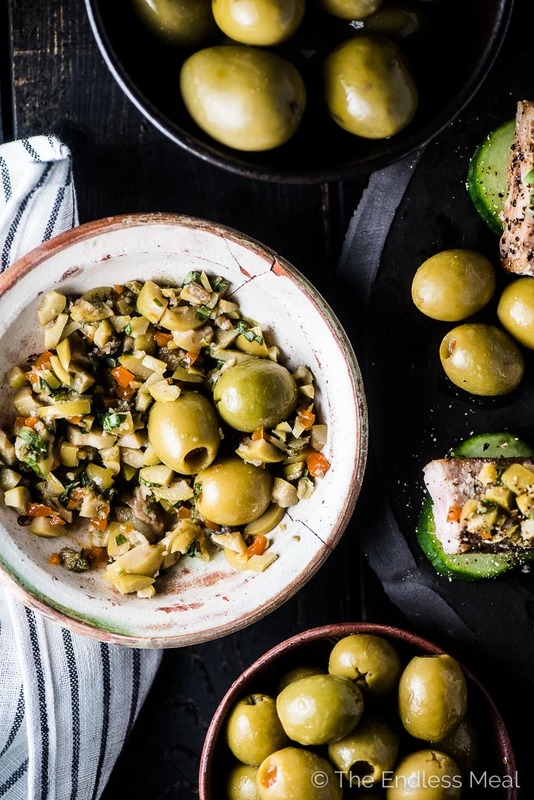 It reminded me of the Easy Marinated Olives from Spain recipe I shared with you earlier this year. Next, season both sides with a little salt and lots of pepper. Then sear the tuna steak for about 1 1/2 minutes on each side in a super hot pan. This is the only tricky-ish step as we all tend to want to overcook meat. Just remember, this is sushi-grade tuna that can be eaten completely raw. 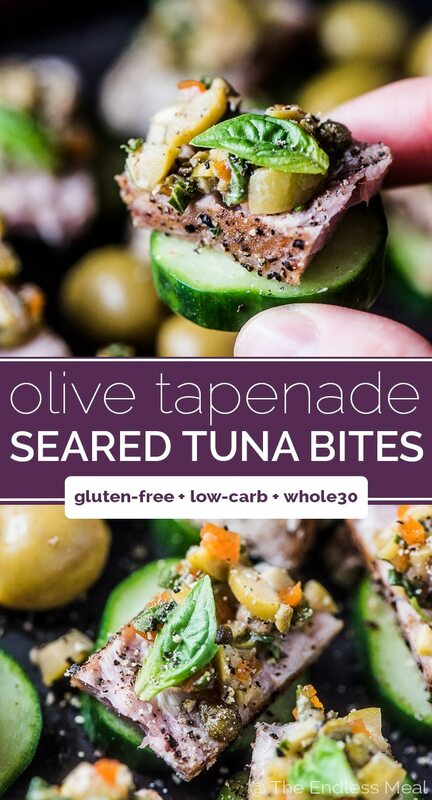 Now all you have to do is slice the tuna, pop the slices on cucumber rounds, and top with a little of the tapenade. To make them extra pretty you can finish them with a tiny basil leaf. 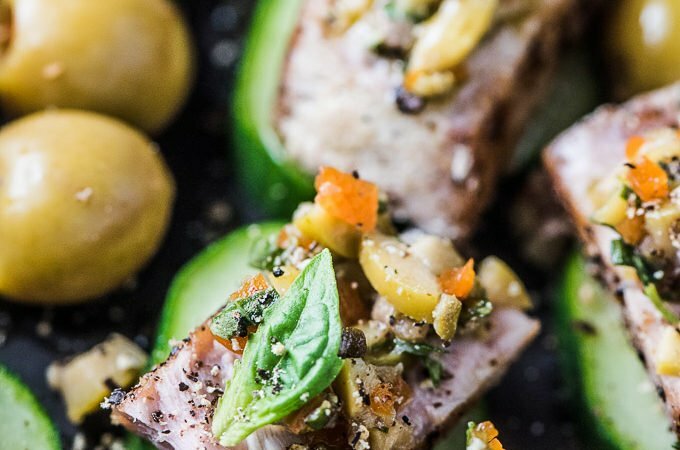 And if you don't have any parties in the near future, you can turn these seared tuna bites into lunch. Slice the tuna, fan it out over an arugula salad, and top with the Spanish manzanilla olive tapenade. So easy and so delicious! To make the tapenade, mix the Spanish manzanilla olives, capers, lemon juice, sherry vinegar, thyme, anchovies, and minced basil in a small bowl. Place a cast iron pan over high heat and let it heat until VERY hot. While the pan is heating, season both sides of the tuna with pepper and salt. Just before adding the tuna to the pan, pour the oil into the center of the pan and place the tuna on top. Sear for 1 1 /2 minutes then flip over and sear for 1 1/2 minutes more. Remove from the pan, let cool slightly, then slice into 12 pieces. 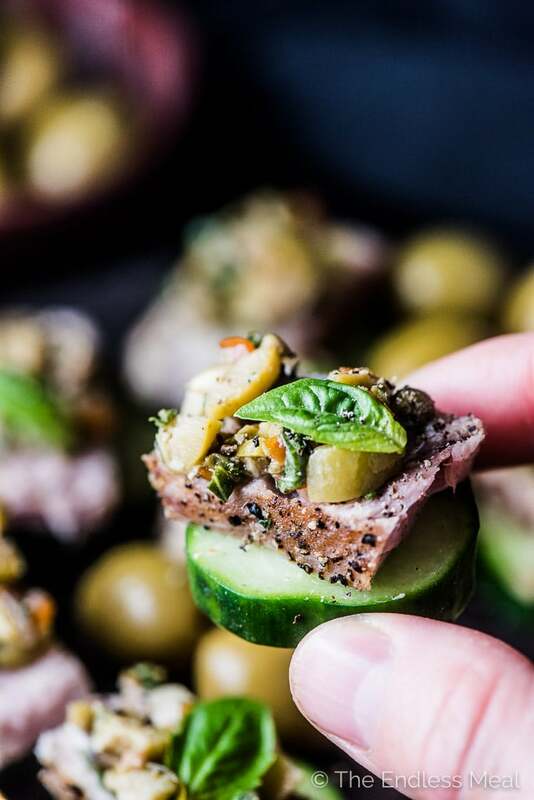 Place one piece of tuna on top of each cucumber slice, top with some tapenade, a little basil leaf, and some black pepper. This seared tuna can be assembled a few hours in advance and kept in your fridge until you are ready to serve it.